Ah, stress. Stress is something most folks deal with daily. 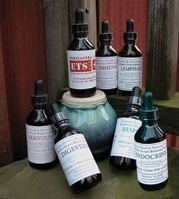 The Stress Kit includes: the MBP Immune, Lymphatic, Digestive, Endocrine, Nervous and Respiratory Solutions and the ETS for Humans (all in 2-oz. bottles), and the option of adding an 8-oz. Essence of Perelandra (EoP). The goal is to help us maintain strength and balance during times of stress so that we may make good decisions and act in constructive ways. This doesn't magically remove the situation causing the stress. It gives us what we need to successfully address the situation with strength, calmness and grace. The Solutions contained in this kit are all easy to take and come with simple directions. No PKTT (kinesiology testing) is required. You can start using them the day they arrive. Take twice daily. If you're hit with something sudden, take 1 dose (10 – 12 drops) every 5 minutes for the first 20 minutes. Take twice daily (first thing in the morning and at bedtime). Once things have settled down again, take these six Solutions for an additional two months. We refer to EoP as "balance in a bottle." It contains the electrical patterns that reflect that deep balance of the Perelandra garden — a balance only made possible by the focused intentional partnership with nature. If you're feeling frazzled or that the walls are closing in on you or that you'd just like to scream . . . Take an Essence of Perelandra Stress Break. Take a quick shower first. Then fill your tub (with water!). Add 1/3 of the 8-oz bottle (approx. 79ml) of Essence of Perelandra (EoP). Don't add soap, shampoo, bath oil, bubble bath or chicken gizzards to the EoP bath. It's just you and your EoP. Now lie back, relax and soak for 20 minutes. Don't rinse yourself off. Just pat yourself dry (with a towel!). An alternative to the Perelandra Stress Kit is to work with PIC and test the focus "my stress" to get personalized information and recommendations. All seven bottles in 2-oz./59.1ml size each.